Exotic, Handmade and Sustainable. All at Reasonable Prices. If you know someone who is getting ready to welcome a new child to their family, or are expecting one yourself, then you’ll appreciate this project! 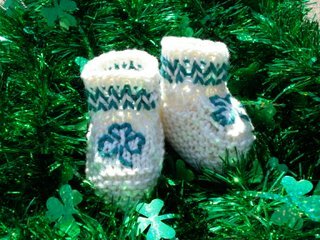 Just in time for St. Patrick’s Day, take a look at this adorable pattern for little Irish booties! This pattern from Vickie Howell will make a great simple project for this spring! 1 Ball “LOVE” (Vickie Howell Collection). Color (MC): Wesley & Buttercup (white). Scraps “LOVE” (Vickie Howell Collection). Color (CC): Mulder & Scully (jade green). With MC, CO 35 sts. Using only two of the dpns, work in garter stitch (knit every row) for 1 3/4″. BO. Count in 14 sts. in from the top right-side. With MC, pu 9sts. Repeat last 2 rows 3 more times. Leaving 9 sts on hold on needle, seam up bottom, heal and top foot panel. Using tapestry needle and CC and back stitch, embroider Shamrock (or whatever design yourlittle heart desires) onto the top foot panel. With MC and 2nd & 3rd DPNS, pu 17 sts around the ankle of bootie. Next row: In MC, k1, p1 to end. Next row: Switch to CC, *k1, p1 to end. Repeat last 2 rows once more. Next TWO rows: In MC, k1, p1 to end. Weave in ends. Stuff toes with tissue to block. Last week, during the Super Bowl festivities, people talked about a variety of things from who their favorite players were to the team they hoped would win the big game. And while those are pretty standard conversations for Super Bowl season, there was something else that attendees couldn’t stop talking about: Knitting! 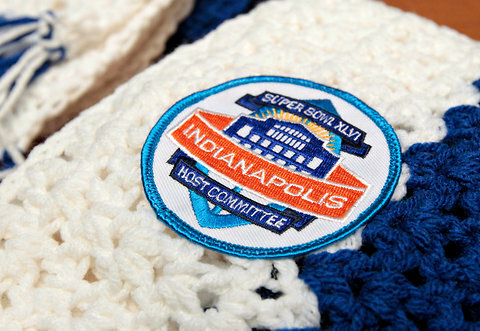 Volunteers from 46 states around America knitted blue and white scarves for this special event. Every Super Bowl volunteer and many VIP’s received one of the scarves as a thank you and a little something extra to stay warm!